China’s burgeoning interest in fine wine is set to get another boost thanks to the arrival of the first batch of Yao Ming 2009 Napa Valley Cabernet Sauvignon into the country. The much-hyped wine is ready for sale at 3,800 yuan (£384) a bottle, but none of the 1,200 bottles will be sold on the open market. According to China Daily newspaper, Ming’s wine will only be distributed among high-end consumers. Made through the former basketball player’s wine company – Yao Family Wines – the Cabernet Sauvignon grapes come from six vineyard plots in California’s Napa Valley. 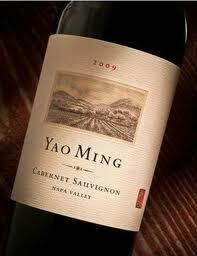 Ming, who has a personal net worth of more than US$65 million, announced the debut of Yao Ming Wine in November. Along with winemaking, Ming has also moved into politics, taking his seat yesterday as a new member of the standing committee of Shanghai’s political advisory body during its annual session. He is not the only celebrity in China targeting the booming fine wine market.